The other day, I posted on Instagram the very first letterpress/bookbinding project I made (in 2005). It was a book of nine proverbs from around the world. The book has its flaws, but so does all that early work, when I was just discovering this crazy thing called letterpress printing. I also can’t help but wonder: if I were to make that book again today, which proverbs would I choose? How has my worldview changed? Though not technically a proverb, this quote by Eleanor Roosevelt would be high on my list: “Light a candle instead of cursing the darkness.” Light a candle. Do something. 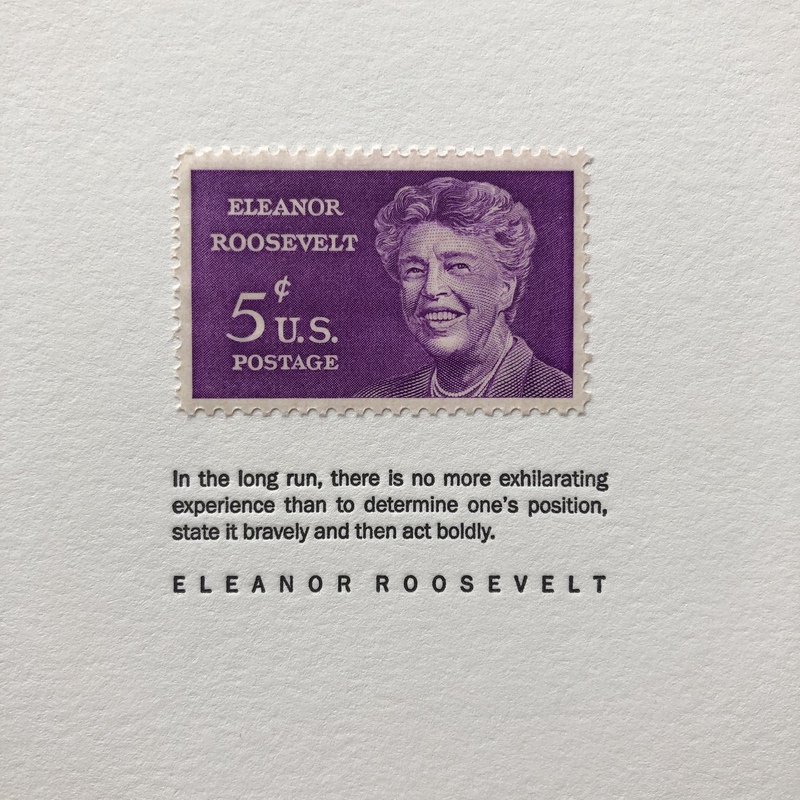 March is Women’s History Month, and I picked the Roosevelt quote in the 2018 tiny letterpress calendar to celebrate that fact, and to encourage us all to “determine [our] position” and “state it boldly” in our own way–whether through the art we create, the conversations we have, or the narratives we attempt to challenge and rewrite (the #metoo movement comes to mind). March also brings the return of #marchmeetthemaker, a month-long Instagram challenge for makers around the world, so you’ll be hearing more from me this month (here or here) as I introduce myself to you more fully. In some ways, I think of this as another way to begin “stating my position”—and I hope you’ll join me in stating yours, too, when I ask for your feedback for a new project I’m designing (watch for it in April). Finally, two independent sources (almost simultaneously) led me to this: Ira Glass, on the gap between our ambitions and the early creative work we do, and the need to keep creating—again and again and again.